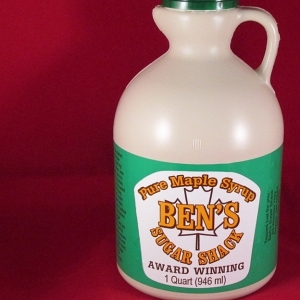 I was recently given a bottle of the Ben’s Sugar Shack Pure Maple Syrup in Grade A Dark Amber and I have to say, it was one of the best maple syrups I have ever used on my pancakes and in my sweet pork tenderloin crock pot dish. into them. The syrup had a rich sweet sugary maple flavor and it taste amazing warmed up and poured over vanilla ice cream and waffles. We even used it over homemade cinnamon French toast and it really brought more of the sweet cinnamon flavor of the toast right out. We also warmed the syrup up and dipped out sausage, egg and cheese breakfast sandwiches into it to add sweetness and flavor to them and it was so good. However, four tablespoons of this syrup contains 200 calories so it isn’t figure friendly, but it is worth eating no matter how many calories it contains. Another way I have been using this deliciously deep flavored maple syrup with a deep dark amber color is to flavor my vanilla herbal teas at nighttime. It helps add natural sweetness and turns my vanilla tea into a maple vanilla tea, which tasted so good during the cold autumn like weather we were having during the time I received the syrup as a gift. through the bottle of syrup fast and I was determined to find out where the syrup was available for me to purchase. I actually found some right at my local grocery store in the syrup and breakfast isle, which was really awesome. The syrup is actually made in Temple, NH at the sugar shack listed on the bottles label. worth it because it actually lasted me a month. A month is a long time for us to have a bottle of maple syrup because we use it constantly due to the amount of pancakes, French toast and other dishes we have the syrup on. I can definitely say this is a maple syrup I would recommend to anyone to use on any sweet dish to add maple flavor and sweetness. It is definitely a syrup I will not be without for as long as it is being made.